This exhibition, the first museum show of Peterson’s art in forty-five years, offers a survey of the wide range of subjects Peterson produced and the styles in which she worked. Peterson (1876-1965) recorded her travels abroad, first as a student to London, Spain, and Paris (where she was a guest at Gertrude Stein’s salon), then Venice and Yugoslavia, before heading to the more exotic Egypt and Turkey. Her home cities of New York, Palm Beach, and Gloucester were an important part of her oeuvre as were pictures of woman, usually in quiet reverie or at the dressing table. As well, floral still lifes and gardens make up a significant part of her output. All these subjects will be covered in the exhibition. Peterson explored the innovative painting techniques of the early 20th century. 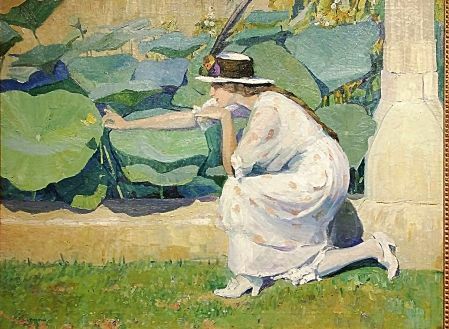 She studied with Arthur Wesley Dow at New York’s Pratt Institute, with Spanish painter Joaquin Sorolla and in London with Frank Brangwyn. Her style moved from Impressionist to Fauvist, and from realism to a modernist abstraction. The variety of works in an exhibit will demonstrate Peterson’s artistic journey. The exhibition offers a glimpse of Peterson’s private life. With photographs and archives, we get a sense of the independent woman, artist, and traveler whose humble origins were balanced by a maturity that permitted financial ease and social prominence. Jane Peterson: At Home and Abroad is organized by the Mattatuck Museum, Waterbury, Connecticut and sponsored by Bank of America; Empire National Bank; The Peter & Barbara Ferentinos Family Endowment; New York Community Bank Foundation; New York State Council on the Arts; Robert W. Baird Incorporated/Baird Foundation, Inc.; and Suffolk County Office of Cultural Affairs.